Wise Mind (Linehan 1993) is the balanced part of us that comprises our inner knowledge and intuition, where our emotional thinking mind (thoughts driven by distressing feelings) and rational thinking mind come together, the part of us that just "knows" that true reality. 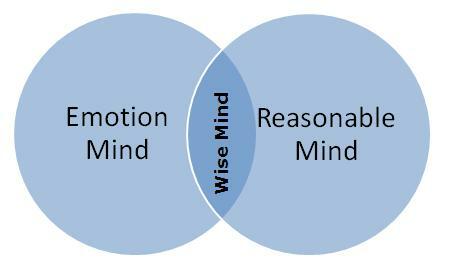 Emotion mind drives opinion, whilst reasonable mind is fact-based (fact or opinion?) Asking ourselves what 'wise mind' might make of this situation will help us to stand back and be more aware of the bigger picture, and help us respond in more helpful and effective ways. Within any meeting of people all the individuals will of course have their own belief system, and will therefore have different perspectives - see and think about things differently - and this will affect the way these individuals interact with each other. We can learn to be more aware of how our own belief system affects us, and consider how others might see the same situation quite differently. "Wise Mind" can be replaced with the most helpful term for you, e.g. clean mind (substance misuse), or "Emotion Mind" could be replaced with e.g. anorexia mind, OCD mind, depression mind, trauma mind. DBT uses the theory of Wise Mind (Linehan 1993) - the part of our mind where 'Emotional Mind' (thoughts based on our feelings) and 'Reasonable Mind' (rational thinking part) merge together.